What is in commercial cat food? If you are a responsible cat parent, and if you ended up here, it’s quite likely that you are, you must have asked yourself whether there is something called ‘the truth about pet food’ that you should know. Eating the same thing day in and day out can seem a little strange to a human since we appreciate variety so much. The lack of variety wouldn’t necessarily be a problem if you were to feed your cat only healthy pet food. 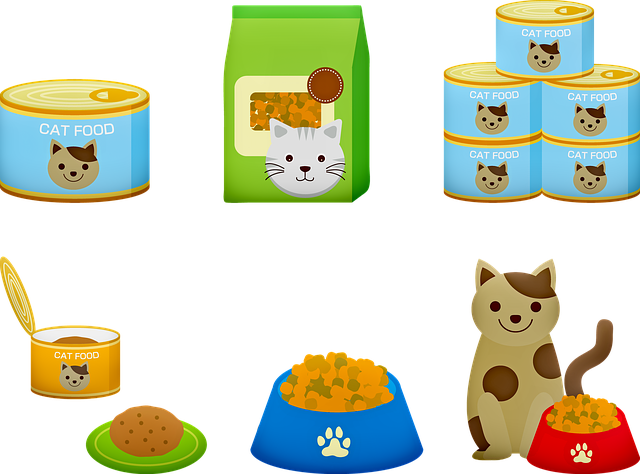 Let’s look at some things that you should consider before deciding on a brand or particular type of cat food. The pet food industry has come up with a wide array of imaginative ways of adding various nasty ingredients to what would otherwise be healthy food for cats and dogs. Some of the ones that we have discovered range from food dye to the so-called ‘meat by-product’ that you’re likely to find among the ingredients of most types of pet food. Then, we have corn and corn gluten meal, propylene glycol, and many other nasty additions. What’s so wrong with pet food dye? If you are a cat owner, you probably know by now that cats aren’t meant to consume other types of food except for meat. They are not optional carnivores – they need meat to survive. Or, if you’d like, they need mainly protein to survive. We’re guessing that you have boiled or roasted a steak before in your life or at least you have witnessed the transition of meat color from red to grey or brown. Many pet food companies find that using marketing and advertising strategies for pet owners makes sense while they couldn’t do that to the actual pets, right? Because the pets can’t buy their own food. As humans, color diversity appeals to us. As such, we might think that the more colorful the dry cat food is, the better. Actually, that’s completely wrong. Whiskas, KitKat, Friskies, and many other such food brands contain kibble that’s shaped and colored as if it were carrots or peas. Have you ever seen a cat that would willingly eat peas? I personally haven’t, but I have seen cats that were famished and ate bread — however, in their natural state, cats shouldn’t eat legumes. Furthermore, if cat foods were to contain only meat, the color would be that of meat that has been cooked, right? But it’s not. So, something fishy is going on, and it has nothing to do with fish. Cat food can contain dyes that range from Red 40 to Yellow 6 – and many of these artificial colors are known to cause cancer. Red 3 is carcinogenic, so we urge you to check the ingredients on the bag before you choose a particular food for your pet. Corn shouldn’t be consumed by cats or dogs. It’s an excellent so-called filler, and it’s cheap, so it will take up a lot of room in your pet’s stomach, therefore eliminating the need for the manufacturing brand to add more protein from meat and various other sources. Simply put, you need more meat to feel full than you need vegetables and grains. But cats are carnivores, so they shouldn’t eat grains. Corn can cause a myriad of medical problems such as bloating and gas and even ulcers and acid buildup. This is even more true in the case of cats because genetically, they can’t digest corn. As for corn gluten meal, it’s a cheap method of boosting the protein content of dry pet food. It can absorb possible toxins that can be found in sources that have been contaminated, but the truth is that most of the corn gluten meal available today is made in China, so that shouldn’t give you any reassurance. Any type of ‘by-product’ on any label of any type of pet food isn’t a good sign. You can’t know for sure where that meat is coming from, and the truth is that some pet foods (especially the one that’s made for dogs) can contain as little as 1% chicken – and by chicken, we mean chicken meat. The manufacturing brands will include plenty of other remains from internal organs to the fat, blood, heads and feet, and even unborn babies and feathers. Some companies might even use the carcasses of other dead pets to manufacturer pet food. Recently, the FDA has discovered traces of pentobarbital (a drug used for pet euthanasia) in some foods. The FDA is of the opinion that those products are still valuable to the pet food industry or capable of reducing strains on the environment. While this ingredient can’t typically be found in cat food because it is toxic to them and as such, it won’t be willingly added to the list of ingredients, it can be found in dog food. Propylene glycol (antifreeze) has the ability to keep the kibble moist, and that’s a property that renders it palatable. Simply put, your dog won’t feel like he’s eating dry corn, so he or she will consume the kibble. When ingested in large quantities, antifreeze causes renal failure, but its toxicity becomes obvious only over time if you feed your dog small amounts of food that contains it throughout the day. Is there something you could do? You can start by doing a little research on the healthiest cat food brands out there. There are some that market themselves as being ‘natural’ or ‘organic,’ but you can’t know for sure if the sources that they use are actually so. You can, however, choose to make your dog’s food at home, or at least part of it. Many veterinarians agree that homemade pet food can be healthier than that which you can buy at a store. You can also make sure that you go through the ingredients before you opt for a new type of food brand. Steer clear of those that contain food dyes since it causes cancer. And usually, if you go on Amazon and notice that the food you’re considering has around 40 lines of ingredients, don’t buy it. If it’s natural, it will have as little ingredients as possible. By the way, this works for human food, too.